If you were to ask any parent who has hosted a birthday party what the two essential aspects are, they would surely tell you planning and patience. Organizing what food to make, who to invite, what activities to set up and more is an endless hole of craziness. It doesn’t have to be a total nightmare though, better yet – it can be easier than you imagined. 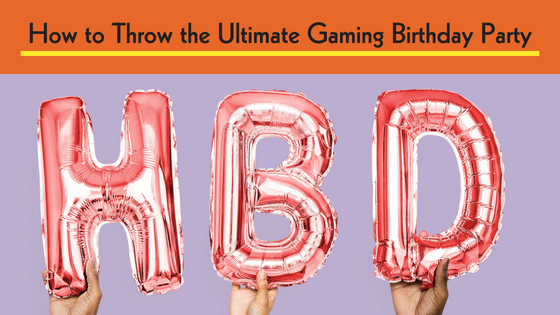 The team at GameTruck Jacksonville is here to help you with some tips on how to throw the ultimate gaming birthday party! The first place to start when throwing the ultimate gaming birthday party is to pick a theme. A theme is important because it will put in place the overall decorations and ideas that later follow when planning the party. What kind of color scheme will you stick to? What kind of cake, snacks, prizes, and activities are best for the theme? You can easily answer these questions once you choose the theme. With so many popular games and media today like Marvel, DC, Fortnite, Minecraft, and Pokemon, just to name a few, there are plenty of customizable themes to choose from! No party is complete without delicious food for everyone to munch on. Traditionally, you can never go wrong with the typical party food, such as pizza, burgers, hot dogs, chips, veggie platters, and fruits. Of course, you can’t forget the cake (correlating with your theme of course). Find fun ideas to spice up the food service; if you’re going to have pizza, why not have a create-your-own-pizza station for example? The sky’s the limit, so be creative with your food and snacks. Having plenty of fun activities for everyone to participate in is an important aspect when throwing the ultimate gaming birthday party. A mix of indoor and outdoor games is an excellent choice. Video game inspired outdoor activities can range from creating scavenger hunts Super Mario edition to FPS Nerf battles like Fortnite and Overwatch. For indoor activities, there are just as many fun options. Play board games based on video games like Portal, Street Fighter, or choose from the hundreds of different themed versions of Monopoly. An enjoyable and simple way to get everyone geared up and into party mode is by having your guests dress up as their favorite characters. This will help spark the creativity within the guests – reenact your favorite gaming or movie scenes or host a contest for the best dressed. The star of an ultimate gaming party – the video games. Having the best games is a must. With GameTruck this can be easily achieved with their multiple TV’s, consoles, and endless gaming titles. Throwing the ultimate gaming birthday party with some prior planning and arrangements can make a big difference. GameTruck parties come equipped with our air-conditioned trucks, multiple flat screen TV’s, and all the best games and consoles. Plan your next event with GameTruck Jacksonville by visiting our website or calling us today at (866) 253-3191.